Construction sites are dangerous places for workers, even when safety procedures are implemented. When the Occupational Safety and Health Administration’s (OSHA’s) safety rules are not followed, tragic accidents happen that cause workers to suffer debilitating injuries or death. According to OSHA, 874 construction workers died in 2015—21.4 percent of all worker fatalities. The majority of these deaths continue to be caused by these “Fatal Four” accidents: falls, struck by objects, electrocutions, and caught in/between hazards. OSHA estimates that eliminating these four types of accidents would save 602 construction workers’ lives every year. Here, we discuss steps employers should take to prevent these accidents on the job site. Railings, toe board, and floor-hole covers should be utilized to prevent workers from falling into open holes. When a platform, floor, or runway is open on the side, a guardrail and toe board should be installed around the perimeter to protect workers. Whenever workers must work near machinery—no matter what the height—guard rails and toe board should be utilized to prevent them from falling into or onto this equipment. Workers should be provided with fall protection, such as harnesses, safety nets, and stair and hand railings. Employers should provide workers with safety gear, such as hardhats and face masks, and strictly enforce rules requiring workers to wear them. Rigging should be inspected to ensure that any suspended materials are secure. In addition, workers must be trained in safety precautions when materials are being moved above them. Materials should be stored properly, especially when they are being kept on elevated work stations. Barriers should be installed to reduce traffic in areas where workers are exposed to objects overhead. 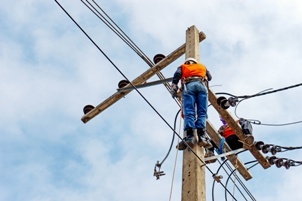 Employees should be kept at a safe distance from power lines. Employers should have the utility company de-energize and ground lines and install sleeves over powerlines. Employees should be provided with ground-fault circuit breakers and be trained in how to use them. Logout and tagout procedures to prevent energy surges should be implemented, and employers should ensure that employees follow them. Faceplates or other fixtures should be used to close circuits and electrical conductors. Any moving parts on tools and other equipment should have guards installed. Many of these accidents are caused when machinery is left unguarded or uncovered. Employers should have procedures in place for workers to avoid collapsing scaffolding or other platforms. Employers should be certain that trenches and excavation sites are properly constructed to avoid their collapse and provide workers with a safe means of escape to prevent them from being buried in an accident. What Are Your Rights If You Are Injured in a “Fatal Four” Accident? If you were hurt in one of these types of accidents, you could be entitled to workers’ compensation benefits to pay your medical bills and replace your lost wages. If your loved one was a construction worker killed on the job, you may be entitled to workers’ compensation death benefits. However, you need the assistance of an experienced workers’ compensation attorney to obtain the benefits you deserve. Start an online chat today to schedule your free case evaluation.